Darkseid has invaded Gotham and the Super Powers team head there to stop him. With the help from their friends, the team manages to take control of the invading forces. Darkseid however proves to be a little harder to subdue. During the chaos, Darkseid releases the inmates of Arkham, causing many heroes to try and contain them. Batman tells Firestorm that he may be able to help against Darkseid's Omega Beams, while Superman heads to space to find a Starro spore. Firestorm manages to hold Darkseid at bay, while Superman places a Starro spore on him. With the Flash's help, they manage to trap Darkseid in a looping Boom Tube. The team later explain that they will send him back to Apokolips, after he's had a few hours of looping. Story - 5: I'll be honest, at first, I wasn't too thrilled to be reviewing this book. I only took it on because Steve asked me to. Now however, I'm glad I did. I actually enjoyed reading and reviewing this book very much. Just goes to show, you really never should judge a book by its cover or art style. I would love for Art Baltazar and Franco to get the opportunity to write one of the regular books one day. They have such a good grasp of the larger scale stories with a large cast of characters. I actually really enjoyed the New Krypton concept in this book, than what DC gave us almost a few years ago in the regular continuity at the time. I love the fact that we got to see so many different characters this issue, from the Arkham inmates to Captain Marvel and even Krypto and Ace. I liked that the story will most likely continue on, as Luthor has more cunning plans up his sleeve, as is revealed in the Fortress of Solitude in the epilogue. I am rather looking forward to reading more. Hopefully I'll get to review them too for the Homepage. I highly recommend checking this book out if you have young ones that are into Superheroes. Art - 5: I've been so surprised at how much I enjoyed the art in this mini-series. Art Baltazar really needs to be given more to do at not just DC, but at WB as a whole. I've said it many times, Baltazar's style really will translate well to animation. Some highlights about this issue were the many panels that featured multiple characters at a time. Also I loved the use of characters such as GL Ch'p and Golden Pharaoh. Along with the use of the classic Super Powers Collection design for characters like the Parademons and Hawkman. Lastly, Krypto and Ace lend a hand. Even the so-called Super Pets were used well and to the best of their abilities. Can't say how much joy I felt when they showed up. Again Art Baltazar should be working in animation, he could do wonders with a new Krypto series alone. 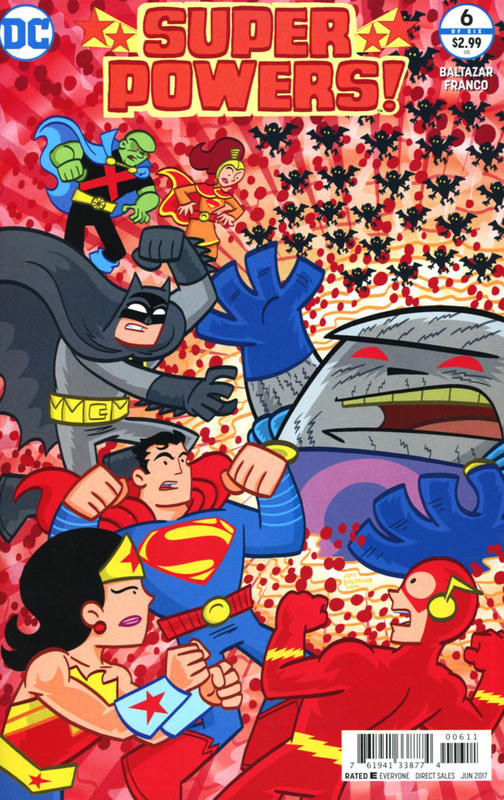 Cover Art - 5: Saving the best for last, I love the heroes taking on a larger than life Darkseid. The Kirby crackle and Parademons in the background are a nice touch.